쌍계사 감로왕도는 1728년 명정(明淨), 최우(最祐), 원민(元敏), 처영(處英), 신영(信英), 永浩(永浩) 등이 그린 불화이다. 이 불화는 구성상 구름을 경계로 2단으로 크게 구분되며, 상단에는 구름을 타고 내려오는 불보살이 표현되어 있고, 하단에는 제단을 중심으로 의례장면, 쌍아귀, 망자 등이 조밀하게 배치되어 있다. 상단 향우측에는 관세음보살과 지장보살을 중심으로 대세지보살과 목건련존자, 아난존자가 무리지어 있으며, 그 앞에는 칠여래 그리고 석가모니불을 중심으로 4여래와 3보살, 번을 들고 있는 비증보살과 인로왕보살 등이 무리지어 있다. 특히 번을 든 비증보살 위에는 망자의 영혼을 극락으로 인도한다고 하는 벽련대반이 표현되어 있다. 이는 18세기 감로도의 상단에 등장하는 도상으로 의령 수도사 감로탱(1786년, 경남유형문화재 제418호)과 용주사 감로도(1786년)에도 표현되며, 백천사 운대암 감로도(1801년)에도 나타나고 있다. 이 불화는 명정, 최우 등이 제작하였는데, 이들이 같은 해 제작한 쌍계사 팔상전의 팔상탱의 형식이 의겸이 그린 운흥사 팔상도(1718년), 송광사 팔상도(1725년)와 유사한 것으로 보아 이들은 의겸과 같은 화파인 것으로 추정할 수 있다. 쌍계사 감로왕도는 화면의 윗부분에 칠여래에 덧보태어 다수의 불·보살이 등장하는 감로왕도 도상의 선구적 위치에 있는 중요한 작품이다. 더욱이 이 그림은 화면 구성 뿐 만 아니라 채색이 안정된, 화질이 뛰어난 감로왕도이다. The Painting of the King of Sweet Dew of Ssanggyesa Temple was painted in 1728, by a group of monk painters, including Myeongjeong, Choeu, Wonmin, Cheoyeong, Sinyeong and Yeongho. 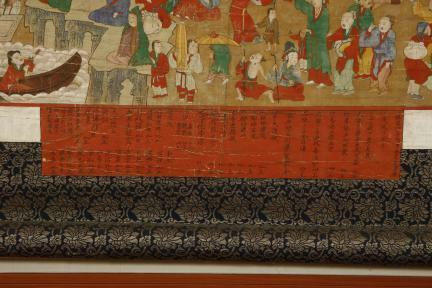 This Buddhist painting is divided into two sections by a series of clouds. The top section shows a Bodhisattva descending from the sky, riding on a cloud, and in the rather crowded bottom section, a scene of a Buddhist rite before an altar is deployed, with the images of demons of hell and dead souls nearby. On the right side, in the top section, Avalokitesvara and Ksitigarbha Bodhisattva stand, surrounded by Mahasthamaprapta Bodhisattva, Maudgalyayana and Ananda, forming a small group. 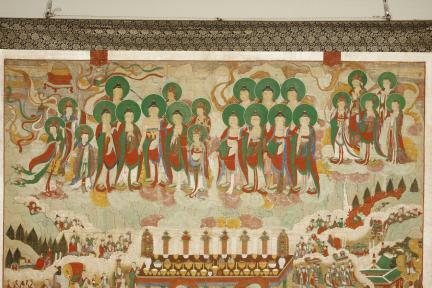 There is, meanwhile, a group of seven Bodhisattvas nearby, but also, standing closer to the middle ground, and next to them, another group of figures, this time, surrounding Sakyamuni Buddha, including four Buddhas and three Bodhisattvas, as well as Bijeungbosal (Bodhisattva Superior in Compassion) and Illowangbosal (Guiding Bodhisattva), holding flags in their hands. Finally, above Bijeungbosal holding a flag, Beongnyeondaeban, a deity whose role is to lead dead souls to Paradise, is visible. Byeongnyeondaeban is seen frequently in 18th-century paintings of the King of Sweet Dew, usually near the top edge of a painting. 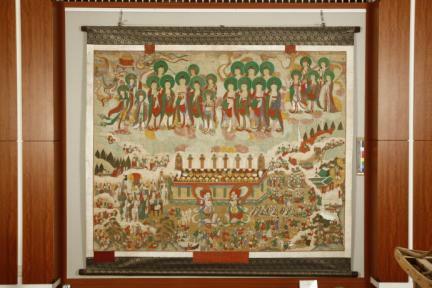 Examples of paintings featuring Byeongnyeondaeban include the Painting of the King of Sweet Dew of Sudosa Temple in Uiryeong (1786, Gyeongsangnam-do Tangible Cultural Heritage No. 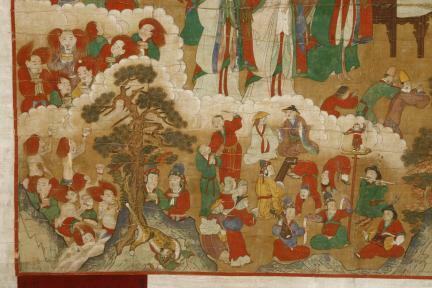 418), Painting of the King of Sweet Dew of Yongjusa Temple (1786) and the Painting of the King of Sweet Dew of Undaeam Hermitage of Baekcheonsa Temple (1801). Myeongjeong and Choeu, two monk painters who are the authors of this painting, appear to have belonged to the same school of Buddhist painting as Uigyeom, judging from the resemblance existing between the Paintings of the Eight Great Events from Sakyamuni Buddha’s Life, painted by them during the same year and housed in Palsangjeon Hall of Ssanggyesa Temple, and paintings on the same theme by the latter, housed in Unheungsa Temple (1718) and Songgwangsa Temple (1725).The Painting of the King of Sweet Dew of Ssanggyesa Temple features more Buddhist figures than other paintings on the same theme from this period – i.e., the group of seven Buddha absent in most others – and is considered a pioneering work in the iconography of paintings of the King of Sweet Dew with a large Buddhist pantheon. This work, outstanding in composition, is also remarkable for its colors.